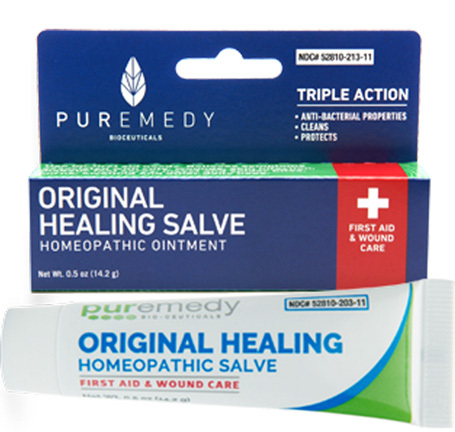 Original Healing Salve, 0.5oz (Puremedy) - Penn Herb Co. Ltd.
Use for first aid needs. Relieves symptoms associated with cuts, wounds, skin infection, diabetic foot sores, insect and spider bites, burns, swelling and other daily uses. Temporarily relieves symptoms associated with minor skin wounds, superficial burns, swelling and itching. Product Uses are based on Homeopathic Materia Medica. Apply topically to affected area 2-3 times a day or as needed, or as directed by your physician. May use a sterile bandage if necessary. Do not use gauze.